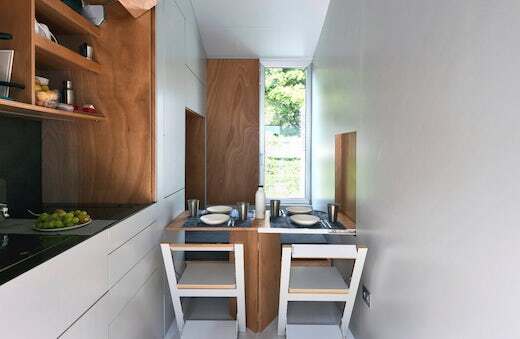 Using transformer units to make the most of the available space in small and micro apartments is not a new idea, but it’s always nice to see new approaches to it. 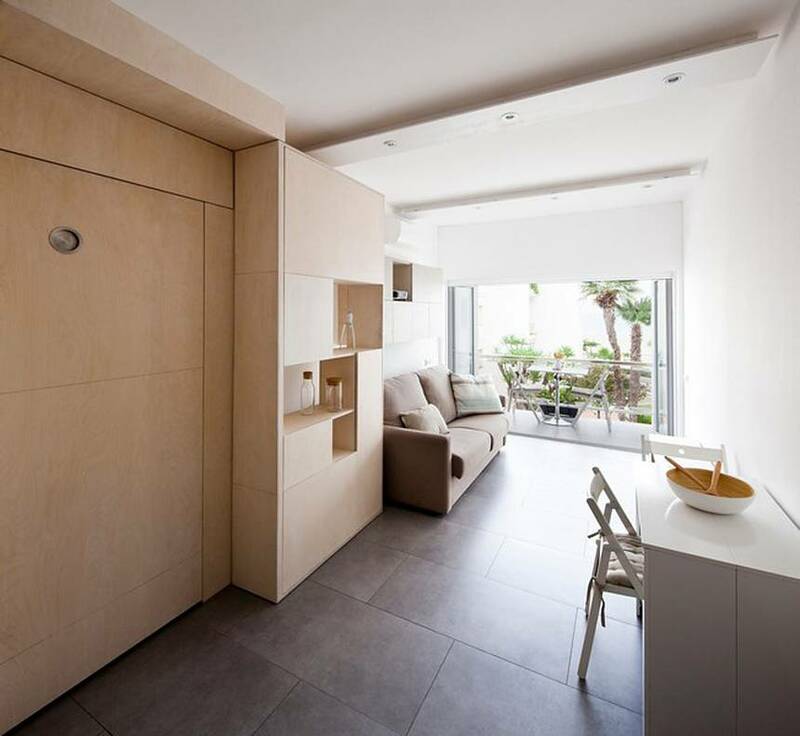 One such is certainly this renovation by Spanish architect Angel Rico who turned a micro, 215 sq ft (20 sq m) apartment into a family home for three. He installed transformable, multi-functional elements and furniture, which makes this apartment much more spacious and comfortable. The apartment is located right by the ocean, so one of the key considerations was maximizing the view. 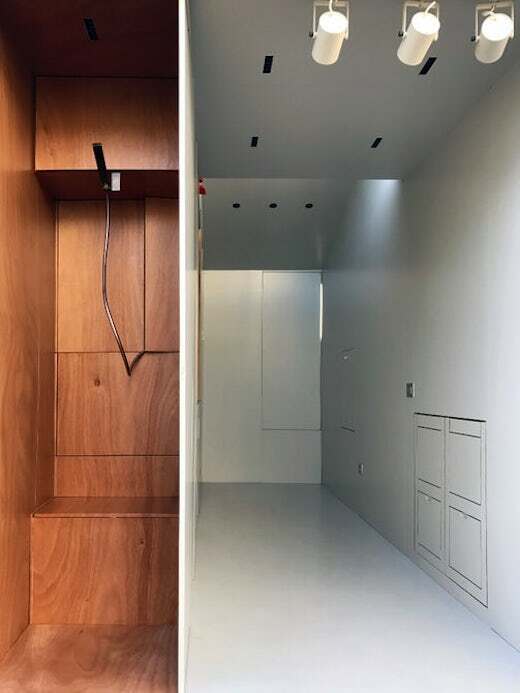 To achieve this, all the storage spaces, such as the closet, pantry and even the child’s bed have been placed on one side of the tiny space, and hidden inside a wall transformer unit. This wall has more than one layer. A part of it hinges out and reveals many smaller compartments, which are used to store various items to keep them out of the way. The child’s bed can also be hinged down then moved out of the way during the day. The top of another part of this transformer wall can be unfolded to open up the kitchen, which can also be hidden away when not needed. The fridge is also stored inside this wall. The bathroom is separated from the rest of the space by another hinged wall, which is also a closet. This set up allows the occupants to shower and dress in the same space. Above the bathroom is a loft, which the mother uses to take naps in, since she works late shifts at the local hospital, though they might turn it into a kid’s bedroom eventually. The living room features a sofa-bed, which is where the parents sleep. They also use this space for entertaining, since it can fit up to 11 guests. This is where they place the extendable table and chairs, which are otherwise hidden in a hatch in the ceiling. The apartment also has a balcony, which works to extend the living space of this micro apartment and makes it appear more spacious. All in all, these renovations and clever uses of transformer furniture make this apartment appear much more spacious than it is. 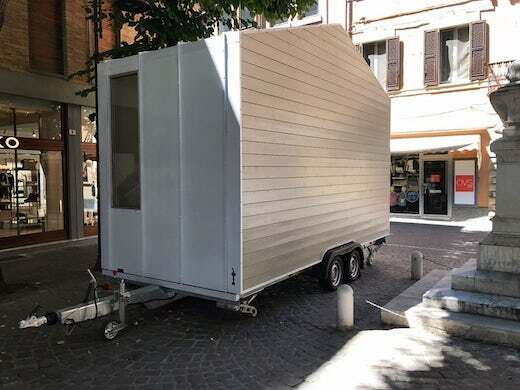 Italian architect and engineer Leonardo Di Chiara recently designed and built a prototype of a micro tiny home, which is seriously small yet still wonderfully functional. 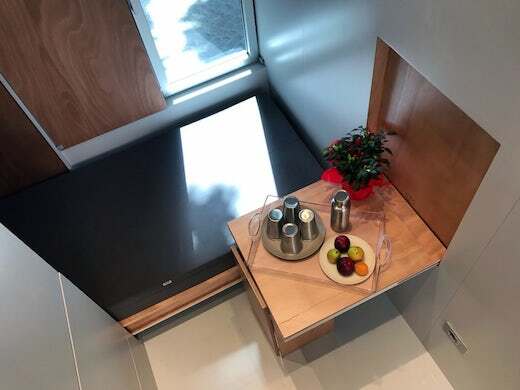 The so-called aVOID tiny house measures just 96 sq ft (9 sq) and is easily towable. Given its diminutive size, it also presents some unique downsizing solutions. The home rests atop a double-axle trailer and has a wooden frame, metal cladding, and plenty of glazing. The interior is comprised of a single room and a bathroom. To make the most of the available space, most of the furniture is hidden inside the walls. The home features a Murphy-style single bed, which can be pulled down when needed, and stored away during the day. It can also be turned into a double bed. The dining table also features a pull down design and can easily be stowed away when not needed. There is also a small, but functional kitchenette, which features a sink, a two-burner induction stove, and some shelving for storage. The aVOID home also features a rooftop terrace which is accessible via a ladder. It is great for lounging on sunny days. The bathroom is tiny and features a shower, composting toilet and some storage space. Di Chiara is still working on the home, and plans to install solar panels and a greywater system, which will make it independent of the grid. 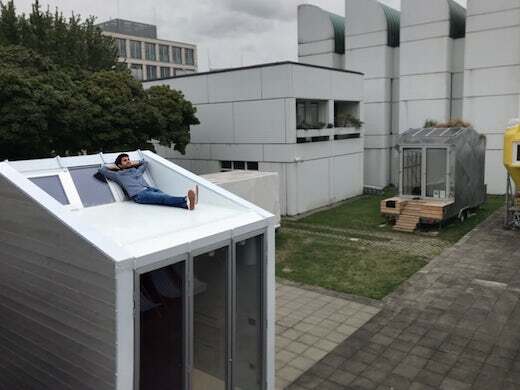 The home is currently on display at Berlin’s Bauhaus Archive Museum of Design, but DiChiara lives in it full time otherwise, with the goal of learning all he can about tiny house living. He says it’s not much different that living at home with his parents, in a small bedroom which must also serve many purposes as one grows up. Prefab homes are a great solution when looking to build fast, and now there is another awesome option to do so on the market. The Italian architect Renato Vidal has recently unveiled a prefab foldable home, which can be installed in less than a day. 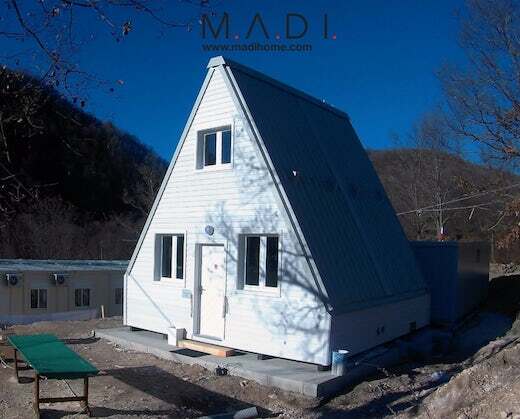 The so-called M.A.Di home comes flat-packed and is built using sustainable materials and means, but designed with durability in mind. It can also withstand earthquakes. The M.A.Di home is made of CLT (cross laminated timber) and manufactured by wood specialist Area Legno in Italy. It is available in several sizes, namely a 290-sq ft (27-sq m) tiny home, a slightly larger 495-sq ft (46-sq m) home, a 603-sq ft (56-sq m) home, a family sized 753-sq ft (70-sq m) home, or an even larger family home of 904-sq ft (84-sq m). All the models have two levels and have a kitchen, dining area and bathroom located on the ground level, and bedrooms on the upper level. The homes feature an A frame structure, which makes it easy to fold them for flat-packing and easy transport to the build site. The home features a steel profile and steel hinges, meaning that each module can be opened and closed with ease. When closed and folded, the height of the package is just 4.9 ft (1.5 m), while opened, it measures 21.3 ft (6.5 ft) in height. All of the M.A.Di modules have galvanized steel frames which are designed to support the home’s opening and closing movement. The homes are waterproofed using Polyurethane foam, which also provides the thermal insulation. In addition to this, the walls are insulated using high-density rockwool, while the windows can either be PVC or aluminum. The actual installation is very simple, since each module just unfolds up. The home doesn’t need a foundation, since it can be anchored in place with a specially-designed screw pile system, which has virtually no impact so this home has a very tiny footprint. 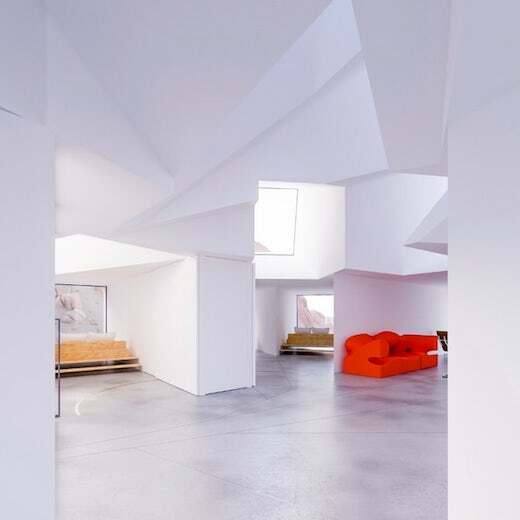 The home can also be built on a reinforced concrete foundation, if so desired. 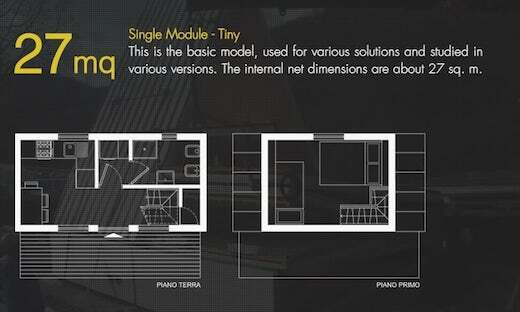 The home can be easily packed away, while it is possible to extend the existing home by adding new modules. It can also be designed according to passive house standards, while there is also the option of taking it off-the-grid by installing a solar power array, composting toilet, water tanks and a gray water system. The price of this home is $933 (€800) per square meter, so the smallest home will cost about $25,195 (€21,600) and the largest $73,385 (€67,200). Some years ago the London-based architect James Whitaker designed an interesting shipping container office, which was unfortunately never built. 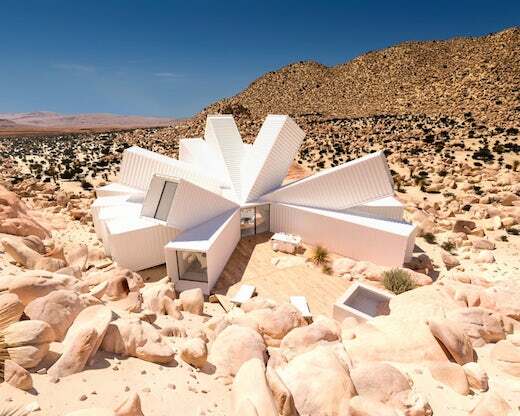 But earlier this year, a film producer from LA came across the plans and commissioned Whitaker to build him a home in the same style on his 90-acre (36-hectare) plot in Joshua Tree, California. The Joshua Tree Residence, as the home is named, will measure a luxurious 2,152 sq ft (200 sq m) once complete. Though very realistic, the pictures are mere renders as construction has not yet begun. Judging from the renders, the residence will be made out of 10-12 shipping containers, which will be left in pretty much the original state. 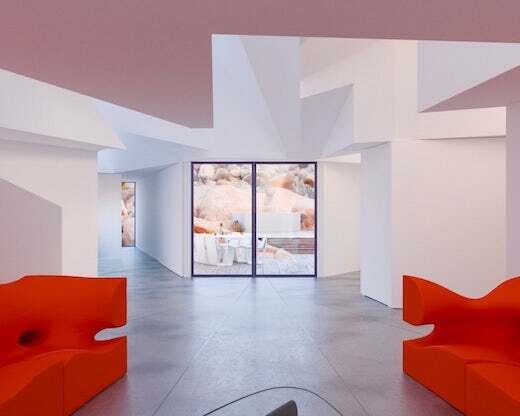 To create the spacious interior layout, the containers will jut out at different angles and inclines. 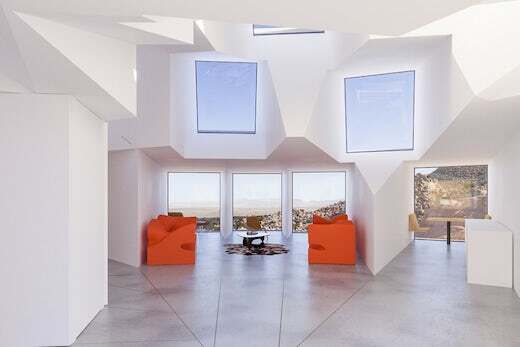 This will also ensure privacy and maximize the view of the surrounding desert. 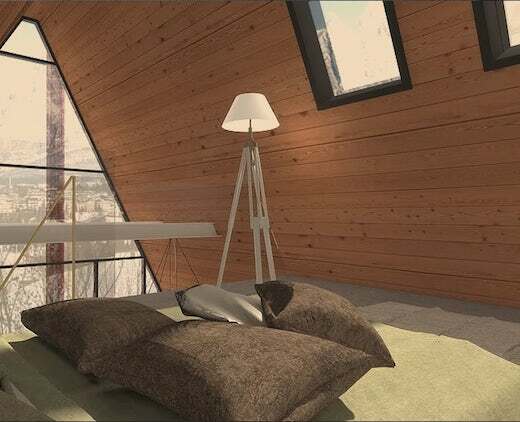 The center of the home, where the shipping containers come together, will be taken up by a spacious living room, which will offer amazing views, while its large windows will let in plenty of natural light. Elsewhere, the home will also feature three bedrooms, each with its own ensuite bathroom, a kitchen, and a dining room. There will also be a covered area for parking, which will be topped by a solar power array that will provide all the necessary power for the home. 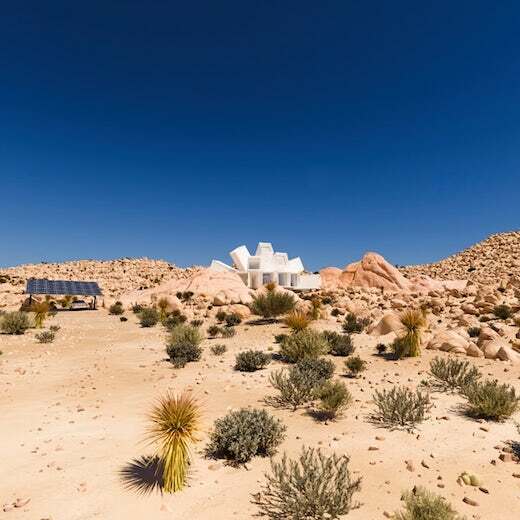 While there will likely be no shortage of sunlight to harvest for electricity, living inside metal boxes in the desert might prove uncomfortably hot. Minimizing the heat gain will be achieved by painting the exterior in a light to reflect the heat, and installing high-performing insulation. 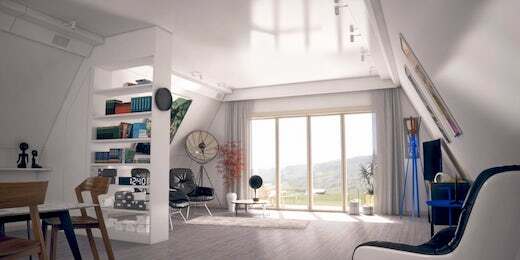 The windows at the top of the house will also let out the hot air naturally, while there will also be air-conditioning units strategically placed throughout the home to cool it. Construction is due to begin in 2018. Germany, among other EU countries, is currently facing the problem of quickly finding adequate housing for refugees and asylum seekers that it has let across its borders. 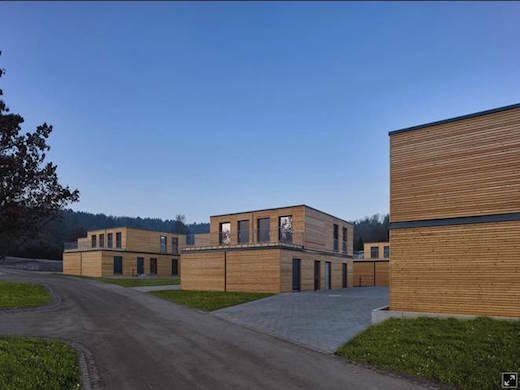 The modular houses, designed for this purpose by Architect and builder Werner Sobek, are a great example of the fact that refugee housing can be modern, affordable and comfortable. 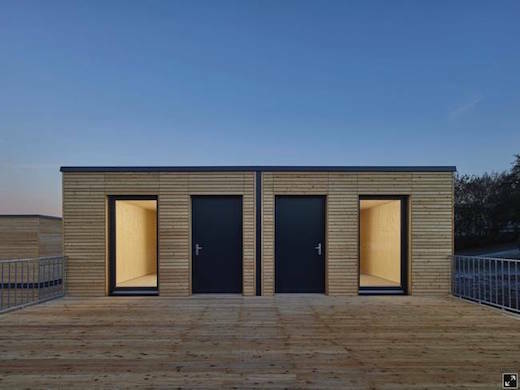 The units are called Aktivhaus, and a whole development of them has recently been completed in Winnenden, which is a town about 20 kilometers northeast of Stuttgart. It can accommodate 200 asylum seekers and functions just like real homes. The development is comprised of 22 units, which were built with quality and durability in mind. 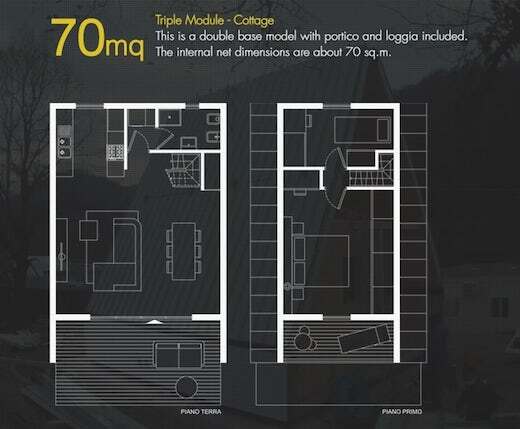 The modules used to build these homes are prefabricated off-site, and arrive to the build site ready to be assembled. They’re made from larch wood, and the company claims they have a lifespan of 50 years. They are manufactured by the company AH-Aktiv-Haus. 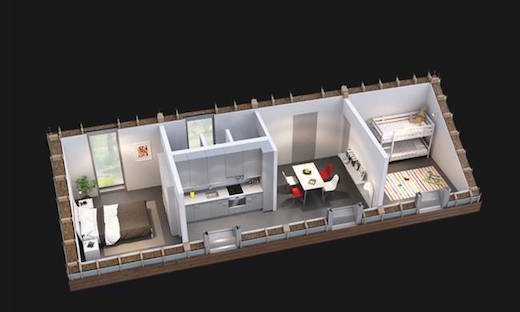 These units will be used to house refugees, but that is not their sole purpose. The German region of Baden-Württemberg is in dire need of additional housing, and they estimate that they will need 40,000 apartments per year for the next few years. About 30,000 apartments will be needed by those granted asylum. 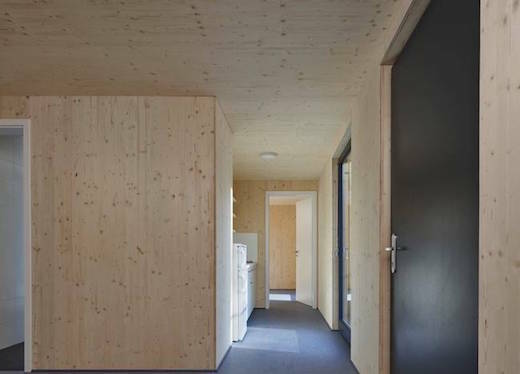 Each Aktivhaus is built according to the so-called Triple Zero sustainable building standard, which was developed by Werner Sobek. In a nutshell, a Triple Zero building is one which consumes no more energy than it generates from renewable sources (Zero Energy Building). Such a building also produces zero carbon emissions, or other harmful substances, which also makes it a Zero Emission Building. Furthermore, such a building can be completely reintegrated into the cycle of materials, making it a Zero Waste Building. In addition to that, it can also be connected into a network of other self-sufficient buildings, power generators, energy storage systems and energy consumers. 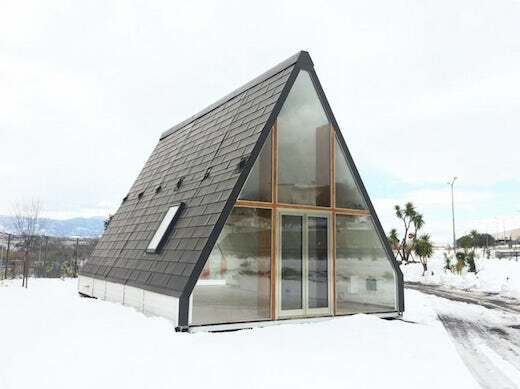 This is certainly a great example of eco-friendly building, and the result is a home that is modern, spacious and would be a pleasure to live in.